VERA CHINESE PHOTO | Riverhead school board president Ann Cotten-Degrasse (right) celebrates approval of the school bond Tuesday night. Some 40 school district officials and Riverhead school bond supporters who had gathered in the high school gym burst into applause, quickly followed by hugs for all, as the results of Tuesday night’s vote were read aloud about 9:45 p.m.
By a slim margin, Riverhead voters had approved the $78.3 million plan for infrastructure upgrades at district schools, though a separate measure for a $7 million gym at the high school was rejected. Proposition 1, the $78.3 million plan, was approved by a margin of just 234 votes. A total of 2,330 residents, or 53 percent of those who voted, cast ballots in favor of Proposition 1, while 2,096 voted against the plan. District officials said the voter turnout was larger than for any budget vote in recent memory. The turnout also exceeded the 3,659 residents who showed up in February 2010 to vote on a $123 million bond plan, which was rejected by more than 60 percent of voters. The gym plan was OK’d by just 1,760 voters, while 2,570 gave it the thumbs down. Proposition 2 was contingent on the passage of Proposition 1. “I think the voters spoke,” Ms. Carney said of the rejection of Proposition 2. The approved measure will fund roof and ventilation repairs at district schools, parking lot reconfigurations, new science classrooms at the high school and kitchens at Aquebogue Elementary, Roanoke Avenue Elementary and Pulaski Street School, among other upgrades. “I was debating it, but it’s really a necessity,” said Helen Zurawinsky who voted at Riley Avenue Elementary Tuesday afternoon in favor of Proposition 1 but not Proposition 2. She called Proposition 2 a luxury that the people of Riverhead could not afford. On the other hand, Maryann DiPalermo, who also voted at Riley Avenue Elementary Tuesday afternoon, said she voted against both propositions because of the inevitability of rising school taxes due to increased pension and benefit costs. “There’s been no increase in Social Security. The cost of living has gone up,” she said. “It’s hard and this is a lot of money. “And I don’t think they should have changed our regular polling places,” she added. Under the new voting system, residents cast their ballots at the building where children in their household would attend elementary school. The lone exception was for voters in the Roanoke Avenue district, who vote at the high school. The new voting districts did prove troublesome for at least of handful of people. At the high school, where school district votes have traditionally taken place, three of the first four people approached by a reporter Tuesday afternoon were at the wrong polling station. One man was supposed to vote at Phillips Avenue and another was supposed to vote at Aquebogue Elementary. The third person, Barbara Hellering of Riverhead, had planned to vote in favor of the bond, but said she would not be voting at all after learning she would have to travel to Riley Avenue Elementary School. 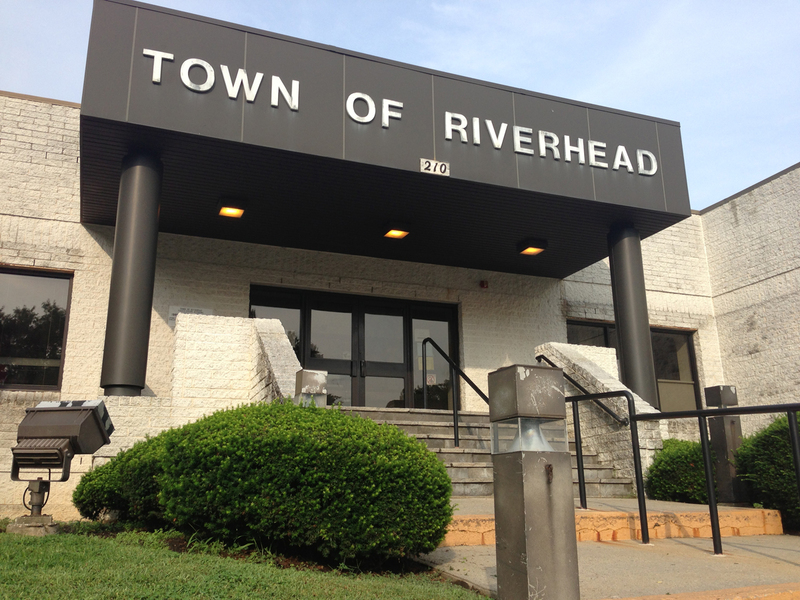 School board president Ann Cotten-DeGrasse attributed the bond’s approval to the work of the Community Partnerhip for Revitalization committee, a team of district employees and community members charged with devising a plan the Riverhead community could support. Many committee members also embarked on a public relations campaign, distributing signs and buttons in favor of the bond and placing advertisements paid for by donors. Ms. Cotten-DeGrasse said she was confident the bond would pass and was surprised by the number of people who rejected it. “It was closer than I thought,” she said. Under the approved $78 million plan, a Riverhead Town homeowner whose house is valued at about $280,000 will pay an extra $40.09 for the 2013-14 school year, the year residents will start paying the bond, according to a brochure provided by the district. That amount will increase to $213.25 in 2018 and gradually decrease after 2033. The bond will be repaid in 2036.